Salsa is my favorite condiment. I could take or leave ketchup. Mustard is a sandwich go-to but sparingly. Mayo is not something I use by choice. But salsa. GLORIOUS SALSA. I could sit down with the jar and a spoon and GO TO TOWN. 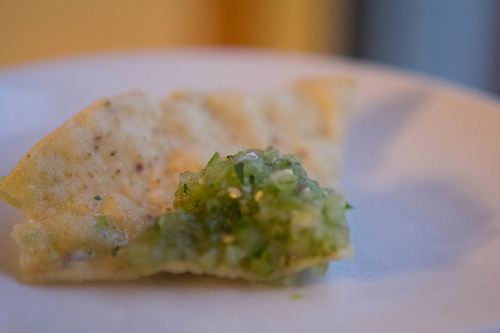 And I dig green salsa too, even though it tends to be a bit spicier and no, it doesn’t really “go” with everything. It’s still good stuff. You know, I’ve never bought a tomatillo before? I have no idea if these are good tomatillos. 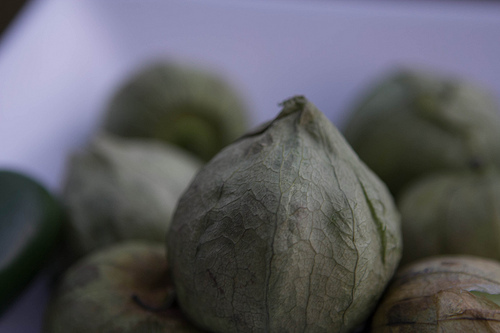 There’s probably a reasonable mechanism for determining the ripeness of a tomatillo. You should google that before you go shopping. They hide those suckers at the store. These were on a side of an end cap on a shelf, somewhere near the bottom. In a bag. 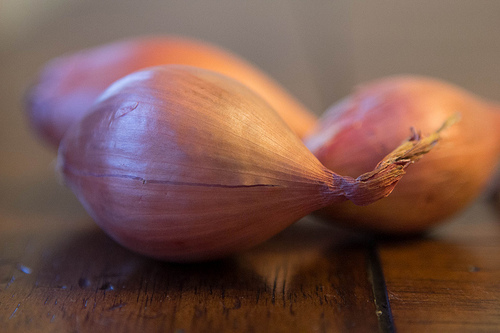 WAY TO HIDE THE SHALLOTS. That’s okay. I wanted to spend five minutes looking. Honestly, I thought they’d be closer to the onions. 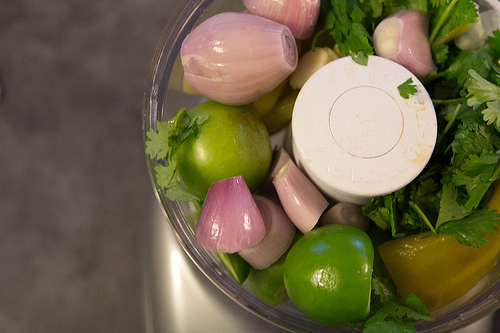 So, you’ve got some tomatillos, shallots, cilantro, a jalapeño, green chiles and other stuff (and you know what that other stuff is because UP THERE you clicked the link for the recipe, right? RIGHT). Shove it all in your food processor. Maybe you chop your stuff into smaller pieces. I think I made my food processor mad with all these big ol’ veggies. I wasn’t really sure what I’d do with this, but it is amazing served with nachos. Chips, some lovely cheddar and for fun some shredded pork… then dunk in the green salsa.